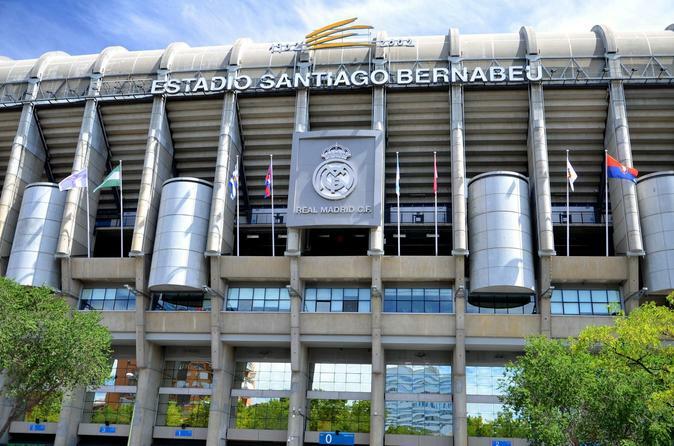 Gain exclusive entry to the Santiago Bernabéu Stadium on a 2-hour tour that can’t be booked anywhere else. You will see areas like the presidential box, the changing rooms and the press room. Discover all the details about the history of the iconic stadium and witness Real Madrid soccer team’s glittering array of trophies in the on-site museum. Hotel pickup from Hotels in the center of Madrid is included, the way back from the Stadium you will have to do it on your own. Do not miss the opportunity to visit the Bernabéu Stadium. This tour is designed for lovers of football that want to explore the home of one of the world’s most popular soccer teams. Standard tour: If you choose this option, we will send the passes to access the Santiago Bernabeu Stadium and the Museum. You will have the opportunity of enjoying on your own the locker rooms, the benches, the press room and more than 1500m2 of Real Madrid Museum, an exhibition of the 32 league titles and 10 European Cups (legendary players, audiovisual first team gold balls, rain of goals, basketball, sounds Real Madrid, kings of Europe and more). The pick up from your Hotel is also included, please give as the Hotel details at the booking time. Once the tour finishes, you will have to go back to the Hotel on your own. VIP tour: If you choose this option, a private guide will explain you all the secrets of the stadium. While you're there, the facilities will be illuminated so you can see every corner in detail. Explore the locker rooms, benches, the museum, press room and more. Soak up a panoramic tour of the stadium, with the chance to see an exhibition of the 32 league titles and 10 European Cups (legendary players, audiovisual first team gold balls, rain of goals, basketball, sounds Real Madrid, kings of Europe and more). The pick up from your Hotel is also included, please give as the Hotel details at the booking time. Once the tour finishes, you will have to go back to the Hotel on your own.